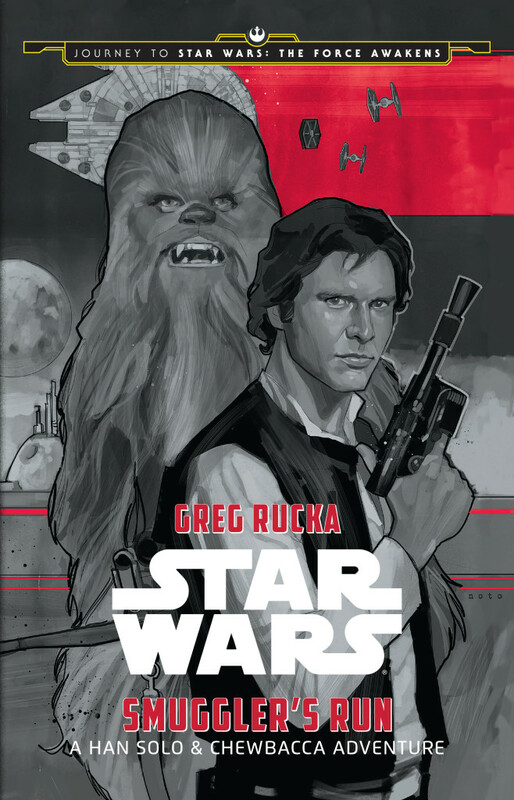 Amidst the half dozen new Journey to Star Wars: The Force Awakens novels is Greg Rucka’s Smuggler’s Run. Compared to Aftermath, or Lost Stars for that matter, it’s a slim book at just 183 pages. It’s also being marketed at 8 to 12 year olds. But don’t let the age range or the page count fool you, this is a book worth checking out. Greg Rucka writes this story in a voice that’s on par with any adult Star Wars novel, and while it’s a quick read, it’s fun. Click here to read our full review. Smuggler’s Run by Greg Rucka is out today from Disney Lucasfilm Press. Han Solo and Chewbacca the Wookiee team-up for an all-new adventure in this thrilling upper middle grade novel. Set between Star Wars: A New Hope and Star Wars: The Empire Strikes Back, the story follows everyone’s favorite pair of smugglers as they fly the Millennium Falcon on a top-secret mission for the Rebellion. Hidden in the story are also hints and clues about the upcoming film, Star Wars: The Force Awakens, making this a must-read for fans old and new! Jedi-Bibliothek has some more news on the recently announced upcoming Star Wars books for this Fall including prelim covers and blurbs. Author Kevin Hearne revealed that Heir to the Jedi is hitting the New York Times Bestsellers List. More Than 20 New Star Wars Books This Fall! The headline says it all: more than twenty new Star Wars books. EW and StarWars.com both have articles on this breaking lit news. For the lovers of the written word, this is very good news to hear. At least 20 new books—from novels for adults and teens to storybooks and stickerbooks for younger kids—will be released this fall to fill the gap between 1983’s Return of the Jedi and this December’s The Force Awakens, EW has learned exclusively. Those hoping to find out what Luke Skywalker, Princess Leia, and Han Solo have been up to for the past three decades will find it first on the page, with Disney Worldwide Publishing and Lucasfilm Press confirming that the titles will be filled with Easter eggs foreshadowing events in J.J. Abrams’ Dec. 18 movie. This new flood of literature is being called the Journey to Star Wars: The Force Awakens. According to EW, “Many of the books are still being written and edited, so details (including who is writing them) are still under wraps.” But they were able to reveal a couple titles. Star Wars: Aftermath by Del Rey, Star Wars: Journey to the Force Awakens and Star Wars: Journey to the Force Awakens-C-3PO, both by Marvel, and Star Wars: Ships of the Galaxy by Studio Fun International. DK will be getting in the action with Star Wars: Absolutely Everything You Need to Know. As part of their Young Adult novels, Disney-Lucasfilm Press will be publishing Moving Target by Cecil Castellucci (Princess Leia adventure), The Weapon of a Jedi by Jason Fry (Luke Skywalker adventure), Lost Stars by Claudia Gray, and Smuggler’s Run by Greg Rucka (a Han Solo adventure). So, for adult readers, the big news is Aftermath and question of what author will be attached to the project. That said, it’s great to hear so many books are coming out, and hopefully the YA novels will be worth checking out. With Star Wars Celebration Anaheim right around the corner, more news may not be so far away. Posted by Skuldren for Roqoo Depot.